Ralph Waldo Emerson ... 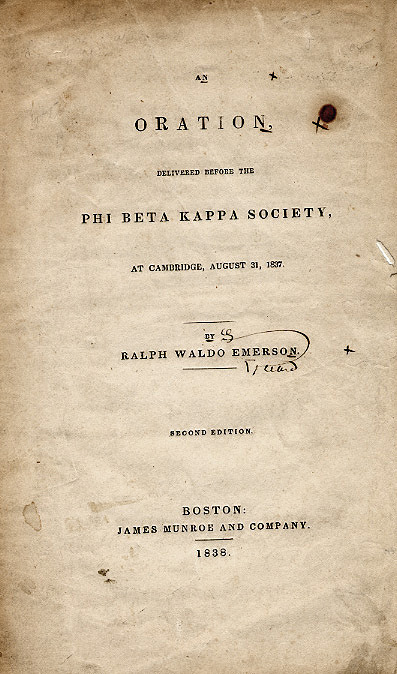 In 1841, he included the essay in his book Essays, but changed its title to "The American Scholar" to enlarge his audience to all college students, as well as other individuals ... Placed in his Man Thinking: An Oration (1841), the essay found its final home in Nature; Addresses, and Lectures (1849). In the light of this hope I accept the topic which not only usage but the nature of our association seem to prescribe to this day,—the American Scholar. ..... class, the scholars of their day—are addressed as women; that the rough, spontaneous conversation of men they do not hear, but only a mincing and diluted speech.